PM Narendra Modi during his addresses at Palace Grounds, Bengaluru (Photo by ANI). 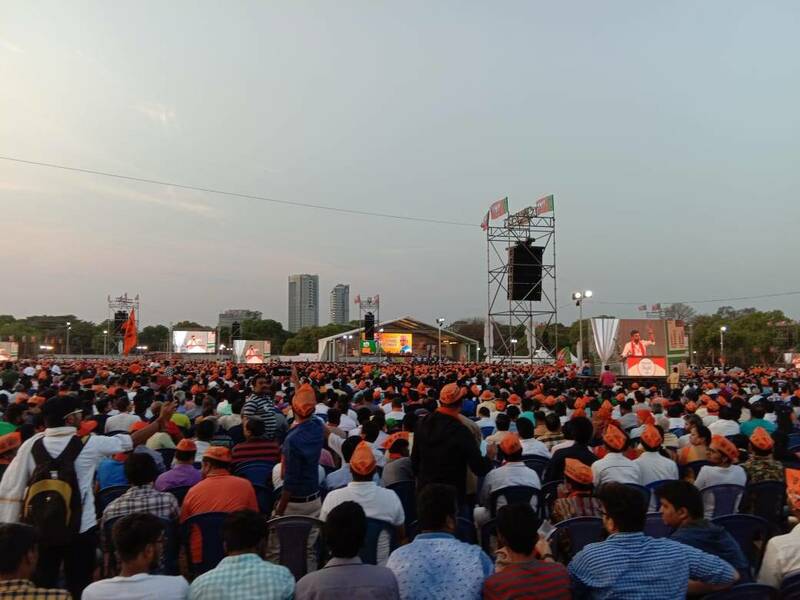 Modi in Bengaluru Highlights: Campaigning for the Lok Sabha elections 2019, Prime Minister Narendra Modi addressed a public meeting in Bengaluru, Karnataka. He was being accompanied by top leaders of the party from the state. In his first rally in the city, Modi tried to woo voters from Bangalore Central, North and South, Bangalore Rural and Chikkaballapur constituencies. Modi reached the venue late, by 7.30 pm, where tight security measures were in place by the Bengaluru city police. The City Traffic police had diverted the traffic and had issued an advisory to the public regarding the parking of vehicles in and around Sri Krishna Vihar Palace grounds. Prime Minister Narendra Modi addressed a rally at Bengaluru's Palace Grounds. Here are the highlights. Some people started leaving the venue as soon as Modi began speaking. While one said he was heading home, another lady said she was rushing as she did not want to miss her bus. The address which was first scheduled to begin at 4.30 pm was postponed to 6.30 this morning. However, it took yet another hour for the Prime Minister to reach Palace Grounds, Bengaluru (7.30 pm). Demonetisation, Balakot strikes, Development: What a young voter at Modi’s Bengaluru rally has to say on why he’s backing the BJP. PM Modi: "we worked for ease of business"
PM Modi said, "Congress has worked for ease of loot while BJP has worked for ease of business." PM Modi said, "We have laid the foundation for a digital India with Rupay, BHIM app and we are taking the digital dream of Indians forward." PM Modi: "Congress party is very committed to the demilitarization in Kashmir and asked the audience whether they agree with this situation"
PM Modi at the rally said, "we have isolated Pakistan internationally and now only China is with Pakistan. Earlier only Russia was with us and all others were with Pakistan, we have changed this situation." PM Modi says, " lunchtime conversations have revolved around why India has been unable to respond to terror attacks like US and Israel, but now we have proved that we are capable." PM Modi criticises Congress government in Karnataka for 'failed security features' deployed. Raking up old bomb blast events that occurred in the city, he asked, "Has something like this ever happen during my tenure?" PM Modi remembers former union minister Ananth Kumar and former Jayanagara MLA Vijayakumar for their contribution to Bengaluru. Soon after Modi arrived on stage, Bangalore North BJP candidate D.V. Sadananda gifted the PM a portrait. Tejaswini Ananth Kumar greeted the PM; S.M. Krishna gets a seat next to Modi as BJP Karnataka President B.S. Yeddyurappa welcomed the audience. BJP Karnataka President BS Yeddyurappa welcomes Narendra Modi, Former CM SM Krishna and other leaders. Prime Minister Modi arrives at Palace Grounds, Bengaluru. To begin address shortly. Meanwhile, at K.R. Nagar in Mysuru, JD(S) supremo H.D Devegowda slams PM Modi and BJP. "Siddaramaiah and I stand in front of the voters because the Modi government has misused powers for 5 years by only giving false promises to the country," he said. Ahead of Narendra Modi's visit to Bengaluru, Congress leaders have taken a dig at the PM and the BJP demanding a report card on the promises made in 2014. Congress candidate for Bangalore North Krishna Byre Gowda tweeted, "Modi ji, welcome to Namma Bengaluru. When giving your magnificent 'Achhe Din' speech at the election rally, pls be sure give a report card on the promises your party made to Bengaluru in 2014. Bengaluru wants answers!" From International airport towards west, south and North part of Bengaluru K.I.A.L. – Hebbal Flyover underpass – Rt.Turn – Kuvempu Circle – Lt.Turn – B.E.L. Circle – Sadashivanagar P.S. Jn., - Rt.Turn – B.H.E.L. Circle – Lt.Turn – Maramma Circle – Margosa Road – K.C.General Hospital and move further ahead. PM tweets on his way, says Tamil Nadu DMK-Congress alliance "in big trouble." While PM Modi is on his way for his Bengaluru address, he tweets that the political climate in Tamil Nadu is not in favour of the DMK-Congress alliance. Political climate in Tamil Nadu clearly favours NDA. Have a look at pictures from Theni. Thousands await PM Modi's arrival at Palace Grounds. Crowds gathering around. PM Modi to arrive soon at Sri Krishna Vihar, believed to be BJP's lucky venue. Team Indian Express Bengaluru brings to you LIVE Updates from Palace Grounds where PM Narendra Modi is about to begin his address. Modi in Bengaluru Highlights: Prime Minister Narendra Modi addressed a BJP rally in Bengaluru Palace Grounds today. With the polling day fast approaching in Karnataka, it is expected to boost the party's image and influence among voters. Bengaluru is home to over 70 lakh voters from across five constituencies spread in and around the city. BJP expects more than 2 lakh voters for the rally. As many as 11 huge LED screens have been installed at the venue. Also Read: Elections 2019: How will Bengaluru vote? In 2014, all the three city constituencies; Bangalore South, Bangalore Central and Bangalore North went the BJP way with margins of more than one lakh votes. In Bangalore South and North, the margin of victory was more than two lakh votes. The state leadership is confident of repeating the fete for Lok Sabha Elections 2019 as well. However, competition is tough in Bangalore Central this time and a triangular contest is expected with multilingual actor Prakash Raj jumping into the fray as an independent candidate. Bangalore South constituency has also hit headlines this time as BJP unexpectedly announced 28-year-old Tejasvi Surya as their candidate over popular choice Tejaswini Ananth Kumar, wife of former union minister Ananth Kumar.